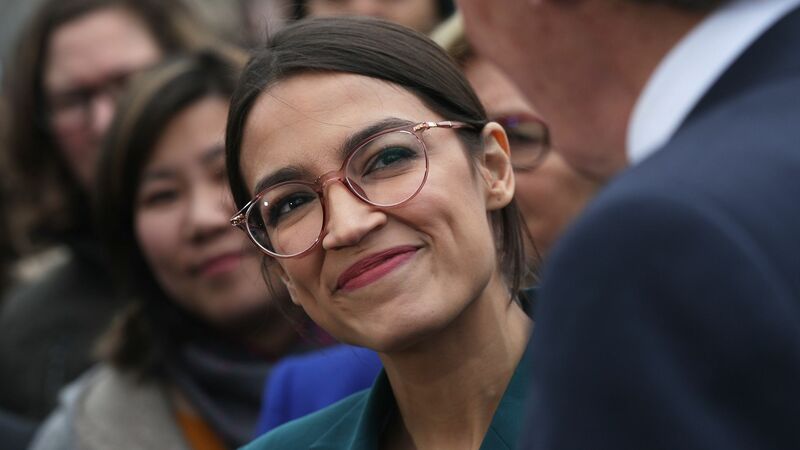 Rep. Alexandria Ocasio-Cortez (D-N.Y.) was more recognizable to a focus group of Wisconsin swing voters than every Democratic presidential prospect except Bernie Sanders, Joe Biden, and Elizabeth Warren. Why it matters: AOC has only been in Congress for a few months, yet she's breaking through even in rural areas of the Midwest. It's not a great start for the 2020 Democrats who aren't recognizable at all in Wisconsin, a key battleground state, despite all the national attention they’re getting. This was another takeaway from the Engagious/FPG focus group of swing voters I watched last week, which included eight Obama/Trump voters and four Mitt Romney/Hillary Clinton voters. Between the lines: They even knew some of the issues she stands for (though not the Green New Deal). That's more than they knew about the senators. "Her latest slogan was: 'I'm here to serve; I'm not here to gain power," one woman said of Ocasio-Cortez. Another mentioned her focus on environmental issues and tackling inequality. Beto O'Rourke didn't resonate with them. "I think I've heard the name on the radio," said Adam K., a 47-year-old Obama/Trump voter. Only three people knew Kamala Harris is a senator, and one man, George E., said "I saw her on The Colbert Show." How it worked: We showed the focus group participants photos of each candidate without their name and asked them to score on a scale of 1 to 10 how confident they were in recognizing that person. Sens. Cory Booker, Amy Klobuchar and Harris scored at or around 2.5 out of 10. Everyone else was virtually unrecognizable among these Wisconsin swing voters. Jay Inslee and O'Rourke earned a score of 1 out of 10, and the rest — Julián Castro, Kirsten Gillibrand, Pete Buttigieg, John Delaney, and John Hickenlooper — fell below that. Somewhat surprisingly, these voters recognized Tulsi Gabbard even more than Inslee and O'Rourke.